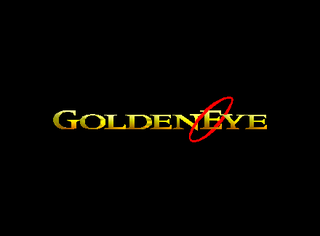 GoldenEye 007 is the definitive first-person shooter on the Nintendo 64, and arguably one of the titles that really made Rare famous. Oh, there's a lot to cover. Unused content from Bond's giant selection of gadgets. 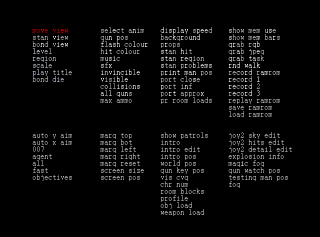 Deep within the ROM, coding remains for a ZX Spectrum emulator. It seems that Rare programmer Steve Ellis wanted to test out whether the ZX Spectrum could be emulated on the Nintendo 64, and added it to his current project at that time. While the methods to access the emulator were removed before release, the emulator itself is still fully functional and handles all 48k and smaller Spectrum titles, albeit with no sound. Included with the emulator is a homebrew replacement for the Spectrum "monitor program" ROM, containing rewritten versions of the few ROM commands required by the games so as to avoid infringing on Amstrad's copyright. One fact that isn't well known, is that a ZX Spectrum emulator is hidden in the game code. 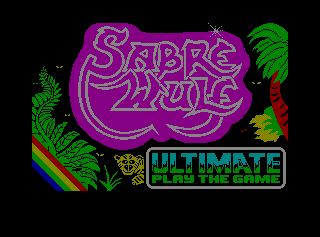 At one time, we had the idea of including an arcade machine within the game to play old Rare games, including Ultimate Play the Game. Unfortunately we didn't have time and the idea was abandoned. 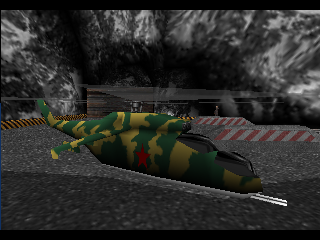 While no ZX Spectrum game ROMs are included in the final GoldenEye build, there is a list of Rare-developed games tucked away within its files. The listed games are Alien 8, Atic Atac, Cookie, Gun Fright, Jetpac, Knight Lore, Lunar Jetman, Pssst, Sabre Wulf, and Underwurlde. Notably, Jetpac later appeared embedded in Rare's Donkey Kong 64; not only was it legitimately accessible in that game, it was required! A patch has been released to make the ZX Spectrum emulator easily accessible from within the game, as well as replacing the homebrewed monitor ROM with the official one since the copyright has long since been lifted. The patch also includes ROM images for all of the above games. From the folder view, press L, R, and either the C-buttons, D-Pad buttons, or A on Controller 3 to start one of the above games. 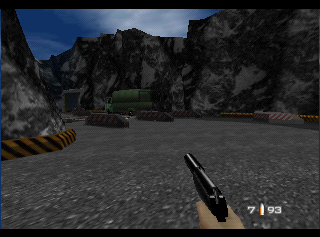 From within the emulator, press L on Controller 1 to return to GoldenEye. 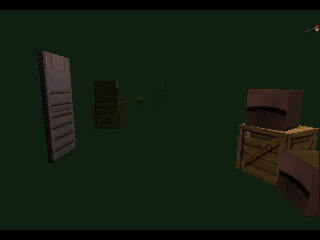 Taking advantage of emulation inaccuracies, the player may maneuver the camera for a HOM effect that will fill in the debug menu. On hardware, only the bottom half can be filled in. 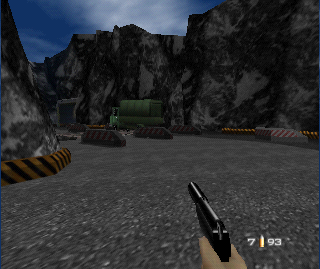 GoldenEye contains a debug menu with numerous options; however many of them will no longer work. To enable the debug menu in the North American version, use the following GameShark code. With this code enabled, press C-Up + C-Down at any time to open the debug menu. It is composed of eight columns of options spanning two rows. The options are very hard to read because they flicker constantly. The currently selected option is always marked in red, which may help with navigation. Press Up or Down on the D-Pad to move between options in the current column. Left and Right on the D-Pad move between columns — the first column of the second row is reached by pressing right in when in the last column of the first row and vice-versa. Press A or Start to enable the currently selected option. 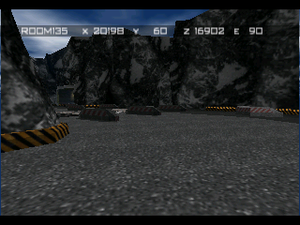 Pressing Start when in control of the player will also open the watch menu and close the debug menu. move view 1 Enables the camera to be moved freely around the level with the control stick, at the current height of Bond. The game will still run, but Bond is invulnerable as long as this mode is active. 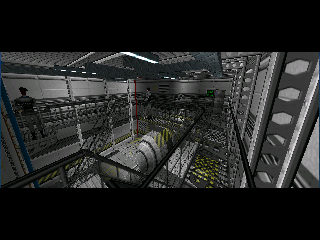 Only the parts of the level which are currently loaded into memory can be viewed. In multiplayer, this is functional, but a random player's height is used and all screens move at the same time. stan view 2 Centers view, hides first-person weapon and ammo count, and disables drawing of objects. "Stan" implies it is intended to do something related to collision tiles. bond view 3 Used to return to the normal first-person camera after using the "move view" and "stan view" options. play title 7 Returns to the main menus. If in a mission and its objectives are complete, it will be considered complete, otherwise it will be failed. bond die 8 Kills Bond or, in multiplayer, a random player. invincible 7 Toggles the Invincibility cheat. visible 8 Toggles the Bond Invisible cheat. collisions 9 Disables player collision with objects. Called Bond Phase internally. all guns 10 Activates the All Guns cheat for the current level. max ammo 11 Gives the player the maximum amount of every ammo type. This is the same as the Maximum Ammo button code. display speed 1 Toggles some kind of speed display. background 2 Toggles the level's background (level geometry) on and off. props 3 Toggles the level's props (object models) on and off. print man pos 7 Grabs the color value of the collision tile Bond is currently standing on and converts it to 24-bit RGB. pr room loads 11 Creates a string with a list of all possible rooms, 150 in total, in the current level. Unloaded rooms would be printed as a period, loaded as a single digit. The string never gets drawn, however. show mem use 1 Reads the table of allocated memory. Was intended to display debug information to show how efficiently memory was being allocated, but the routine has been mostly gutted. show mem bars 2 Was intended to display the percentage of geometry memory in use using a string of "=" characters, each representing 4% of memory. The routine never actually draws the string, however. grab rgb 3 Both of these go into an infinite loop when selected, which locks up the game, due to them requiring development hardware. Most of the code for them still exists, however. They would have switched game rendering to 32-bit, copied the screen buffers and sent them to a capture routine, and set the game rendering back to 16-bit. Another routine would then take the captured screenshot and convert it to the chosen image format. The output routines, however, are gone. grab task 5 Generates a full 4 MB memory dump and attempts to send it to development hardware. Must be activated by pressing both the A and B buttons on controller 1.
record ramrom 7 These do nothing in an unmodified game, but their intended function is still in the North American version's code and it can be re-enabled with a patch. They allow recording a demo, like the ones which play after the title sequence. The 1 - 3 options use the corresponding numbered start points defined in the level's setup file, whereas record ramrom always uses 0, which is the normal player start point. replay ramrom 11 If RAM/ROM recording functionality has been restored, this will play the demo currently stored in memory. save ramrom 12 Will crash the game when it attempts to retrieve a filename from a PC attached to development hardware. load ramrom 13 Reloads the current RAM/ROM demo into memory. auto y aim 1 Toggles Y axis auto-aim off or on for whichever player activated the option. auto x aim 2 Toggles X axis auto-aim off or on for whichever player activated the option. 007 3 Temporarily unlocks 007 difficulty. 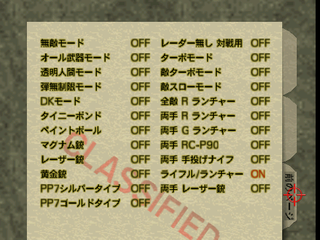 Note that 007 is only available for missions which are already available to be played on 00 Agent. agent 4 Temporarily unlocks all missions on Agent difficulty, with the exception of Aztec and Egyptian. all 5 Temporarily unlocks all missions on all difficulties. fast 6 Enables Turbo Mode, which cannot be toggled off and is retained between levels. objectives 7 Completes all objectives in the current mission. Using it again will set objectives back to their previous state. This is persistent across the game session. 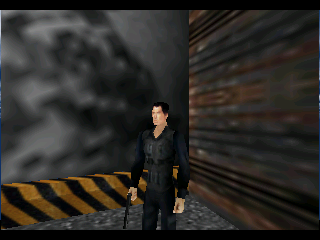 intro 2 Plays the part of the intro camera where Bond raises his gun in first-person view, at the player's current location. vis cvg 7 Draws the entire game in white, with model edges being highlighted in black. This is the same as the unused Line Mode cheat. obj load 11 Reads through the current mission's action blocks looking for object loading commands and loads all of the called objects' models into memory. Does not actually display anything, and appears to have no function in the final since all missions stay within their assigned memory allocations. weapon load 12 Loads the third-person models of all weapons associated with the current level into memory. Like "obj load", this does not display anything, so it appears to have no effect in the final game since all of the levels have enough memory for all weapon models. joy2 detail edit 3 Allows a texture's level of detail (LOD) to be edited. 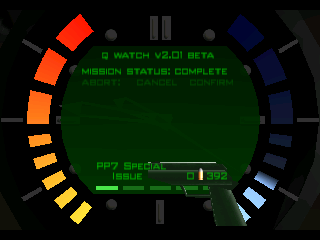 gun watch pos 6 Allows the weapon model in the watch menu's first page to be repositioned with the C-buttons. testing man pos 7 Displays the number of the room the player is currently in, their X, Y, and Z coordinates, and the direction they're facing both as a compass direction and in degrees. This is also available as an unused cheat option. 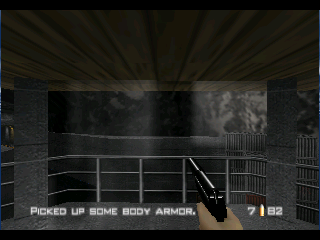 Unlike the other single-player maps, these load properly and have correct starting points, ammo boxes, and body armor. Statue has a poor framerate and parts of the level occasionally don't load when playing with more than two players. Cradle also suffers from framerate problems and thrown weapons have collision issues, often falling through the floor. The uppermost area is a single room with a pyramidal shape: four ramps exit it in the cardinal directions, making 90-degree turns at their base into one of four large rooms on the middle level. The middle level consists of these four large rooms, each of which has a different geometry feature, which are detailed in the gallery below. 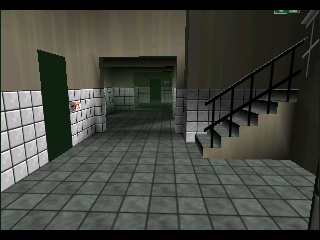 The four rooms are connected to the lower level via a ramp directly across the room from the one leading to the upper level, and to each other via corridors near these ramps. The lower level consists of a single room, larger than any of those used on the middle level, with a pathway running along its outer perimeter, and two large ramps descending into the middle. There are tall pyramids bordering the center of this room, and a bridge which spans the gap over the ramps. The level has a unique green sky with orange clouds, and unlike other multiplayer-specific levels, its slot is set up to play a single music track. This track can be heard normally in multiplayer as one of the many random tracks that can play in multiplayer-specific levels. The upper room, with four ramps leading to the middle level. A narrow ramp with two entrances, which winds its way up to a small platform at its top. 16+ shaped paper thin pillars arranged in a 4×4 grid. Three "guard towers" facing each other. Each has a ramp leading to its upper level. Four tunnels leading into an octagonal-shaped interior. All of the corridors which connect the middle level rooms to each other share this design. The lower room. The ramp leads to the bottom of the gap. The bridge spanning the gap in the middle of the lower room. As can be seen, Citadel is incredibly rough. Its various features seem to have been cut directly out of its floors, leaving gaps of sky visible around them. Its geometry is often paper-thin, having absolutely no depth to it. Only the walls defining the general play area and the lower level are in anything resembling a finalized state. No attempt is made to make Citadel look like a real place — all of its rooms, even those on the lower level, are open to sky, and features which should be visible from other areas are not accounted for. The map shares textures with the Bunker level, but like its geometry, almost none of its texturing is in a finalized state. There are numerous missing textures, along with bizarre scales, rotations, and distortions for the textures that do exist. Citadel was long thought to have been removed from the game, its only remnants being two text strings found alongside those of the other multiplayer levels. The level cannot be loaded normally in the North American or Japanese versions of the game due to it missing required files. 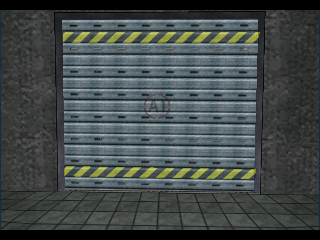 Changes made to the level loading code in the PAL version mean it can be loaded, but the default start point at the (0, 0, 0) coordinate is outside the bounds of any room, so all that can be seen is its sky. Citadel's background was evidently discovered sometime in 2000, however this was believed to be a hoax at the time as only screenshots were provided. Citadel loaded with Cradle's single-player mission setup. There are a number of characters that can be played in multiplayer, but never appear in the game's missions. There are four head models intended for female bodies. Like male characters, female characters can have their head set to random in missions. Unlike males, who will draw from a pool of four random heads, females will all use the same head. 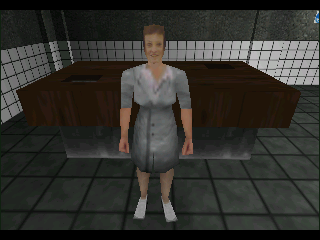 Since all of the game's guards are male (barring the unused female Moonraker Elite), there will always be more male characters in a mission than female, and it's likely only a single female head is loaded to reduce the amount of texture memory used. Comparison of the female and male scientists. 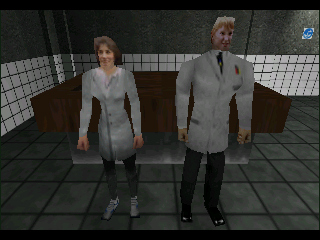 The female scientist lacks the iconic labcoat of her male counterpart and trades the dress pants and shoes for black tights and white sneakers. 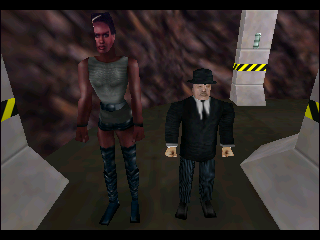 While two of the guest stars, Jaws and Baron Samedi, are featured in the Aztec and Egyptian bonus missions respectively, Mayday and Oddjob only appear in multiplayer. Comparison of the female scientist and Rosika. Rosika is the first of the extra multiplayer characters unlocked with the unused cheat option or button code. 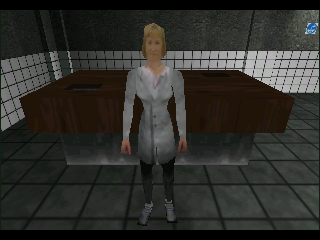 She uses the same head as the Marion character, but her body is unique: it is a variation on the female scientist, with the unflattering filename CfattechwomanZ. She's shorter and, as pointed out by the filename, a little fatter than the scientist, and wears short sleeves, sheer pantyhose and a different style of white shoes. A bluish-gray variation of the Russian Commandant. Given his name, he was obviously intended for one of the St. Petersburg missions, and his uniform suggests he wouldn't have been used as a common guard. Going by the internal character order, the Commandant was probably based on this guard, rather than the opposite. B Jones's face significantly darkened and clad in a black balaclava. 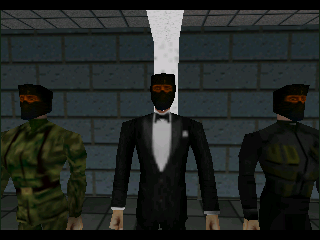 Like all of the extra characters except Rosika, the terrorist wears Bond's black dinner jacket in multiplayer. The balaclava head fits on any guard body and looks good on several of them, so it's unknown if it was originally modeled for a specific body, or intended to be used on existing guards as shown in the screenshot. This section could use some cleanup, and there are a bunch more props to add. An alternate alarm prop. It's index 000, while the alarm that is used is 001. It appears to be double-belled, while the final alarm has a single bell. 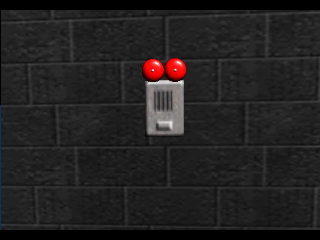 The developers probably preferred the single belled alarm, so this one went unused. 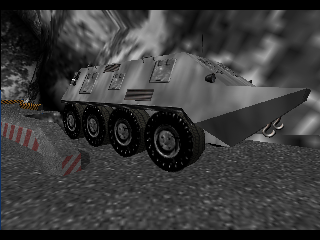 This APC cannot be reliably associated with any of the in-game levels. It isn't a functional wheeled vehicle, so it can only be used as a static prop. A rusty brown metal trash can. 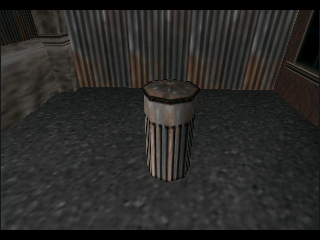 This may have been intended for Streets, as a texture depicting a similar trash can is found among the textures used by that background. 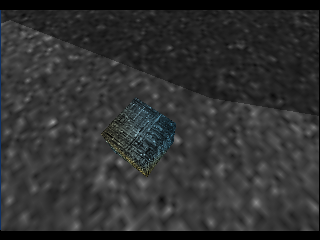 A box textured with a screencap of a Borg cube from Star Trek: The Next Generation and tinted cyan and gold. It is used as a placeholder model for objects whose models were not finished yet, but has its own unique model as well. Two rusty steel doors. The first has a handle, while the "b" variant doesn't, but has defined hinges. 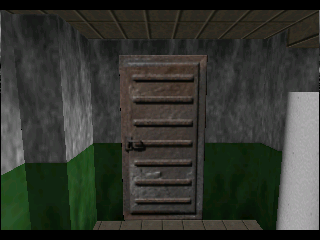 Neither door has the face where the door pivots modeled, as all swinging doors used in the final version do. Pdoor_roller1Z — A blue garage door with yellow caution stripes and a red dashed circle. 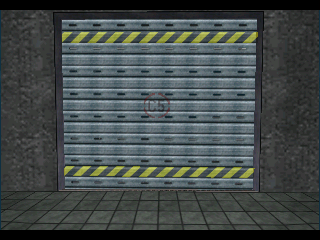 A door similar to this without the stripes and circle can be seen in an early screenshot of Control. Pdoor_roller2Z — A different style blue door with caution stripes, small holes which allow the door to be seen through, and A1 printed inside a red circle. Pdoor_roller3Z — Identical to Pdoor_roller2Z, but with C5 printed in the circle instead of A1. The latter two were likely modeled for Runway or Depot, given those are the only missions that have multiple roller doors. 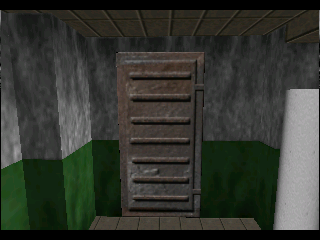 Notably, the doors in Depot don't close the portals behind them, which means you can actually see through the holes when they are closed. A gray fire extinguisher with a red handle. 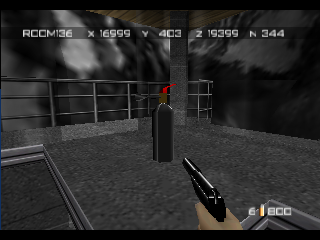 Like most of the game's props, it explodes when destroyed (making it a bit of a fire hazard in and of itself), but it has a unique billowing smoke animation that persists for much longer than normal. Alternate ushankas which are tinted blue and brown. They match certain uniforms well, so it's strange that they go unused in favor of every guard with an ushanka wearing black. A jungle camouflaged Hind helicopter. It has a red star on its side and a mounted gun in the front. 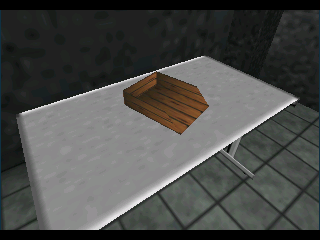 A wooden letter tray, angled to the left diagonally by default. Aesthetically this fits the Archives, although there's no proof it was intended for that mission. 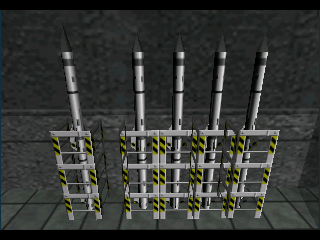 Two props for missiles in a containment rack. There is one for a single missile and one for four missiles together. The nose cone on the standalone missile is slightly taller. The prop with four missiles doesn't have a face for the rack on the right side, so multiple copies of it can be aligned next to each other seamlessly. The silencer from the silenced PP7 prop as its own standalone prop. It's been scaled up to double its normal size in the screenshot to allow detail to be seen. In the final game, the PP7 and the Silenced PP7 are considered separate weapons, so it is unknown how this model would have been used. 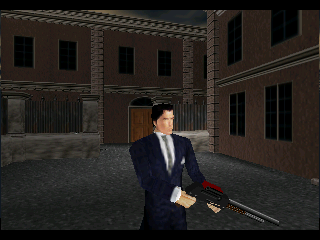 The shotgun has a unique prop, which can only normally be seen using the All Guns cheat at the end of certain missions where Bond retains the last weapon he was using for the outro. A white and blue rotary telephone, angled diagonally to the right by default. An alternate version of the iconic red aiming sight, which lacks the circle around the crosshair. Eight 32×64 8-bit textures which can be placed side-by-side to create a seamless range of mountains. It looks like they were intended to be used as a flat backdrop, rather than being mapped to geometry. They're found near the mountain textures used in Dam and Runway in the image bank. 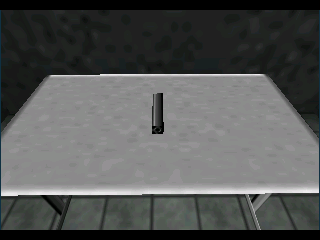 While no final level uses a skybox, Perfect Dark would go on to have them implemented in many of its levels. Face textures for three heads which lack models. According to B Jones, the last one is a plumber who was working with Alan Tipper while they were taking photos to use as face textures. An alternate front face texture for Ken Lobb's head. His complexion is slightly darker than the texture which is used. The unused texture is actually stored alongside the textures used for the sides of his head, while the used texture comes later in the image bank. While characters do have a subtle red tint applied to the places they're shot, the actual impact of a bullet produces sparks. This is because bullet impacts on characters use the same effect as any other surface. 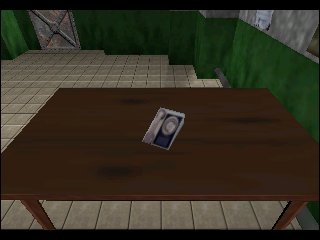 There is actually an unused blood spatter effect, which can be applied to characters with the GameShark code below. This blood is bright red and very cartoony looking as a result, not very fitting for the game's more realistic visuals. 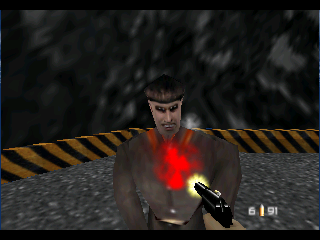 Blood from the GoldenEye box. According to the developers, blood was toned down early in development and Nintendo wanted them to try out different, less-realistic blood colors. This brightness of the blood in the final game might be the result of trying out different shades of red, before dropping the idea of blood spatter entirely. There's actually a shot of a blood impact on the back of the game's box, and it looks to be a darker, more realistic shade of red. There are some music tracks which are wholly unused, and cannot be encountered in the game by normal means. Every single level has an action theme (marked with an "X" in the soundtrack). However, the game only allows one alternate track to be assigned to a level, and most of the ones listed below use something other than their action theme for that track. As a result, their action themes can only be encountered randomly in multiplayer mode. Dam uses blowing wind as its alternate track. Alarms, particularly the ones on the Dam proper which will alert the guards in the tunnels, would be a perfect setting for this theme. Runway uses the short ending tune as its alternate track. 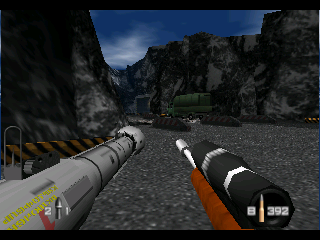 This is also the only mission where a logical placement of the action theme is almost impossible; Runway is an extremely short mission with an "arena" map setting more or less, and involves collecting a key and blowing up a few autoguns at best. There aren't even any alarms to trigger, since guards automatically spawn by default. Frigate's unused ending track noted below is assigned, so this never would've played. Frigate is a fairly docile stealth map with no real opportunities for the action theme to play. Normally the bridge and engine bombs are nothing but props you have to use a gadget on, but if the bombs were to have been primed to explode at some point via a pad trigger then this would likely be a good use of the action theme. Interestingly, there are two copies of this file, implying one might have been for Surface 1. It's a remix of Surface 2, though, which has an ending track. 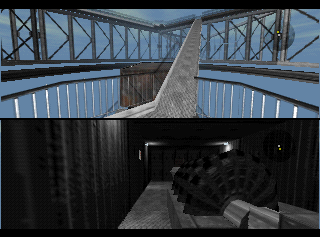 It should be noted that both Bunkers use Bunker 1's action theme, however. Both maps have alarms and plenty of other opportunities for the theme to be used. Statue has ending music, which is used as its alternate track. This seems to be a factor of priority, as this theme would fit perfectly after the Janus reveal. Control uses elevator music as its alternate theme, so this impressive piece goes unused. Almost certainly intended for the "protect Natalya" sequence, given the keyboard sound effects included as a part of the track. Like Control, Caverns uses elevator music as its alternate theme. This theme could have probably played when confronting Trevelyan at the end of the level. This is assigned, but never plays. This track is assigned to Frigate and was meant as a theme to be used when you complete the mission. However, it is never played. While not exactly unused, considering you can hear it on multiplayer as one of the tracks, according to Graeme Norgate's official website, this track was originally meant for Jungle. It makes sense, seeing as Jungle is the only level in the entire game with no music at all (ambience is used instead of a music track), and the track also happens to match its corresponding action theme, when battling Xenia. Again, according to Graeme's official site, this track is listed as Jungle Perimeter, whereas Grant Kirkhope, who composed the theme, simply lists it as Perimeter. It is unknown exactly where it was intended to play. 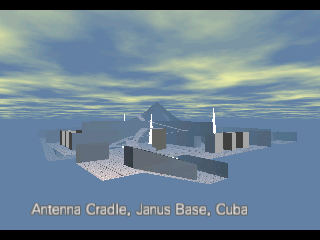 An early draft of the missions seen in Martin Hollis' GoldenEye postmortem includes "Transmitter Perimeter Buildings" as a part of the Arecibo (Cuba) part of the game, so it's likely the title comes from this undeveloped mission. This track is assigned to Citadel, which is odd since no other level intended only for multiplayer has a music assignment. Interestingly, it happens to match Streets' action theme. The difference to the final theme is that the trumpets are stronger and the guitar part at the end is missing. This, however, has only the guitar part, leaving the trumpets completely out. It is significantly shorter (important in multiplayer games), but it can be easily overheard in action. $02 — This is found between the ammo used for pistols/SMGs and rifles. Like those, it's simply called "some ammo" when collected. It has no icon, and a maximum of 200 rounds can be carried. $0E: dart — A dart gun was used in the Moonraker movie, which may be what this ammo type was intended for, but no inventory item makes use of it. Fifty darts can be carried. $0F: explosive pen — Another ammo type without a corresponding inventory item. A prop was reserved for the explosive pen, but was never modeled. You can carry ten of these. $10: explosive case — The ammo type used by the bomb case. Two can be carried, and the mine collection sound is played when one is picked up, rather than the standard ammo sound. $11: flare — Assigned to the flare pistol. Eight can be carried. $12: piton — Assigned to the piton gun. Six can be carried. $13: stick of dynamite — Dynamite isn't an inventory item either. Ten sticks of it can be carried. $15: micro camera — Assigned to the micro camera. Ten can be carried. $1A, $1B — These have no strings or sound effects assigned to them, so it can't even be speculated what they would have been for. You can carry ten of each type, though. The cheat options menu with Line Mode and the player position cheat added. There are eleven cheat options which cannot be unlocked during the course of the game. Six of these options are available using button codes, while the other five require a GameShark to add them to the menu. With the exception of Line Mode, they will all show as "NO NAME" in the menu, as they aren't assigned text strings, but many of them will display their correct name during a mission's intro camera. Note that the directions listed in the button codes should be pressed on the control pad, not the analog stick. Adding options to the cheat menu will push the others down the right column until they can no longer be selected; it seems the menu was only ever intended to display 24 options correctly, although the 25th option can still be selected. Also, unlike the cheats that can be earned normally, there is no way of permanently enabling any of these. Adds Rosika, the game's developers, other random character heads, and the terrorist and biker to the list of characters that can be chosen in multiplayer. 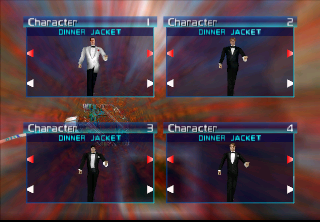 All of the characters, with the exception of Rosika, wear Bond's black dinner jacket and have the height of their first-person view set at 1.0446. This height means their centered aiming position is at the head level of most characters. The button code to unlock the extra characters can be entered at the multiplayer character selection screen. The code is historically significant as it was the only button code officially released by Nintendo. Its release allowed the other codes to be discovered. Note that in order for the GameShark activated cheat option to work, a game must be started with it active. Gives the maximum amount of every ammo type. While it would have made a nice cheat option, albeit one that would be entirely overshadowed by infinite ammo, it's more practical when used as a button code as it allows you to top off your ammo at any time. This code doesn't appear to do anything. This toggles off invincibility for all characters in multiplayer. The only situation this could be useful in is if invincibility got toggled on accidentally, which hints that it was likely added for debugging purposes. 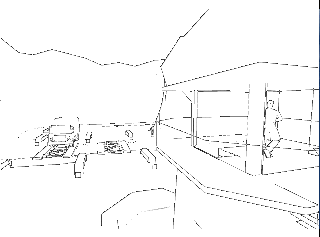 Makes the game look like it was drawn with pen and paper, rendering the entire game white with model edges drawn in black. This seems like the most likely candidate for the "missing" 24th cheat, as it's the only cheat which displays its actual name in the cheat menu. Rare claimed, however, that it did not "make the game more fun in both the single and multi player games", but that it was a useful debugging tool. It is indeed available in the debug menu as the vis cvg option. If line mode was slated for the game, it has some flaws, such as not being able to see certain HUD elements, which may be why it was never unlocked officially. Dam's moving intro sequence with Line Mode enabled. You start with twice as much health as normal. This is displayed as a normal full health bar, but it will decrease by half the normal amount when you get hit. You start with body armor that can take twice as many hits as normal. Like Super 2x Health, this is displayed as a full armor bar that decreases by half the normal amount when hit. You'll start missions with the Cougar Magnum, Moonraker Laser, Golden Gun, Silver PP7 and Gold PP7, and full ammo for all of them. These weapons are the ones that are normally available via individual cheat options. This is like Super x2 Health except, of course, you have ten times as much health as normal. This makes you ridiculously durable, to the point that explosives are the only real threat you'll face. When the cheat option is active, the players slowly turn translucent during the intro camera swirl, until they're almost entirely invisible. The button code will similarly cause players to turn translucent after activating it. It doesn't work quite correctly though, since a player's translucency is lost after that player dies, and the code must be used again to get translucency back. Had the translucency stayed active for the entire game, it would have been an interesting, if frustrating, option. Characters standing still really blend into the background! This is the same as the "testing man pos" debug menu option: It adds each player's current room, X, Y, and Z coordinates, and the direction they are facing to a bar at the top of the screen. It will remain active for the current game session even after the cheat option is turned off. This was obviously only intended for the developers, and never meant as a cheat that could be unlocked during the course of the game. Useful for debugging, but pointless as a cheat option. Which cheat strings are displayed when using button codes and at the start of a mission? Strings for the super health and armor cheats which capitalize the words. The strings that are used in the mission intro when these cheats are activated are all lowercase. These are found with the strings used in the cheat options menu. Strings for the debug option to disable collision with objects. Strings aren't drawn when activating options through the debug menu, and there's no cheat value to corresponds to this option, so the strings are never seen. Found among the (de)activation strings for various cheats. According to an interview with programmer Steve Ellis, this message appeared at one point in development when activating the "Radar Off" cheat, in reference to level designer Karl Hilton and his allegedly intense dislike of the multiplayer radars. The string used in the cheat options menu for cheats without strings assigned to them. These strings are used as the location name and background for missions without defined objectives. While "slow motion" and "fast motion" strings are displayed at the start of a mission when the slow animation and fast animation cheats are active, these are never shown. Found with the strings used in the watch menu. It uses capital letters, which is something none of the watch menu option strings do. Hands are never labeled in the watch menu anyway, since all of the game's control styles are ambidextrous. Pick up strings for the unused ammo types. Pick up strings for the bug (covert modem, tracker bug) and plastique. They're properly assigned to the items, but can never be seen since you start the mission with them. Additionally, the bug never uses any of its strings, since Dam and Frigate rename it. These weapons are only available via cheats and can never be picked up normally, but do have strings assigned to them. Pick up strings for the unused weapons. This pickup string is assigned to several gadgets, however they're either gadgets which are never collected, or ones that have had this string overridden with another one by a mission setup. These strings are found after those used for the multiplayer levels. The ones in the left box would be used to show the selected level in the multiplayer options menu, the right box would be used for the actual selection menu. Only Citadel's strings are finalized; the others are using the internal names of the level slots, with the exception of Cradle's selection string. Interestingly, while Statue and Cradle have unused multiplayer setups in the final version, these strings reveal that Frigate (dest) and Aztec may have also been available at one point. Another interesting thing is that Basement and Stack's strings aren't placed with the other levels, but are found by themselves later in the text file, suggesting that they were a later addition to multiplayer, possibly to make up for the removal of Statue and Cradle or to hastily replace their slots. Aztec is a very large level and the framerate would be miserable; its setup was probably deleted fairly quickly once this was realized. 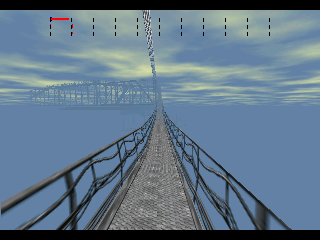 The map's mazelike design of catwalks and dead ends would also not lend itself well to multiplayer. For dest/Frigate, multiplayer would almost definitely have taken place inside the ship only; every multiplayer map (with the exception being Temple) completely disable the skybox for framerate purposes, and most likely Frigate's sea element would also be disabled, resulting in the ship floating in a void. You were originally able to play not only as Bond as portrayed by Pierce Brosnan, but also as the former Bond actors Sean Connery, Roger Moore, and Timothy Dalton (but not George Lazenby, unfortunately). Each of the four dossiers on the file select screen defaulted to a different actor. Unused code exists which allows you to change the actor while a file is selected. 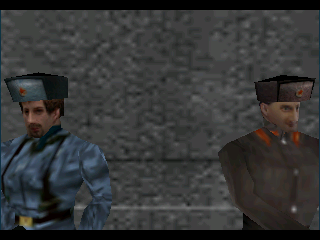 While this selection would have no impact on the normal missions, Bond's appearance would change to that of the chosen actor in the bonus missions, Aztec and Egyptian. Brosnan used the Bond model seen in those missions in the final game, while Moore and Dalton wore similar black dinner jackets and Connery wore his iconic white jacket with a rose corsage from Goldfinger. All four actors were available for use in multiplayer. 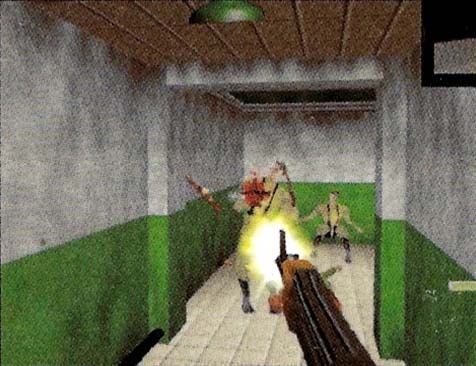 Rare had to remove the former Bonds near the end of development due to legal concerns, but played the four of them in a three-hour deathmatch to 100 kills before doing so. Roger Moore, played by Mark Edmonds, won by a single kill. 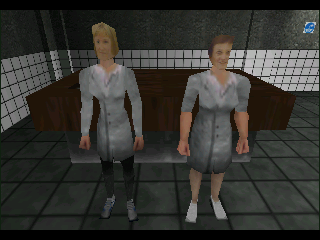 Their head and body models have been completely removed, but the textures for them still exist. 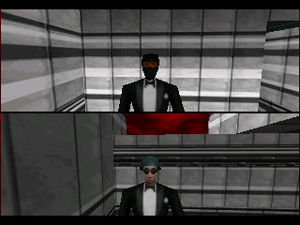 There are also four unused colored textures of the Bond actors; it is unknown what purpose these would have served. Connery, Moore, and Brosnan's images are based on the same ones used for their select photos. 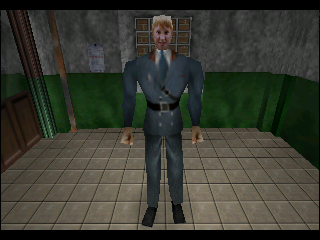 All four dinner jacket bodies were included for use in Perfect Dark's Combat Simulator. 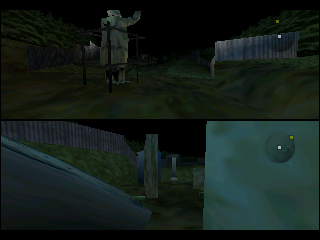 The American and Japanese versions both render the game at 320×237@60Hz, with 9- and 8-pixel-tall black bars at the top and bottom of the screen, making the maximum visible area 320×220. The European version renders at 320×269@50Hz with no borders, however Bond's vertical field of view is the same. All versions' title sequence, menus, and credits are rendered at 440×325. All text in the European version was updated to use British English spellings instead of American English. Now listen carefully, Bond. Those bombs will be armed as soon as the last one is set. Don't be too close when you set them off or you'll go up in flames as well, and while you're at it, please try and bring back that door-opener undamaged for once. Too much rough handling like the last mission and it might go wrong at a bad time. Honestly 007, sometimes I think you damage your equipment on purpose. Now listen here, Bond. Be sure to place the mines carefully, otherwise you won't take out all the tanks in the bottling room. Don't be too close when you set them off or you'll go up in flames as well, and while you're at it, please try and bring back that door-opener undamaged for once. Honestly 007, sometimes I think you damage your equipment on purpose. Q's briefing in the Facility mission was updated. 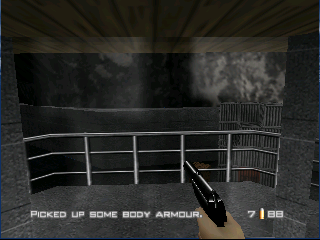 The somewhat-incorrect line about the mines being armed after Bond sets the last one was replaced with a helpful hint about mine placement and some flavor text about Bond's rough handling of the door decoder on a previous mission was cut because the new line takes up more screen space than the original. the tanks in the bottling room. wrong at a bad time. The flavor text was kept for the briefing used in the watch menu, however. The American version simply drops explosions if too many are occurring at the same time. This can most easily be seen by placing a large number of remote mines in different areas of a map and detonating them — any mines over the limit will simply disappear, rather than exploding. The Japanese version changes this and simply won't detonate any additional mines over the limit. 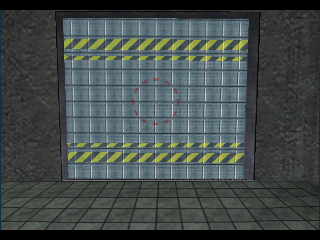 The player is free to detonate them anytime after the first explosions clear. The European version further changes this by detonating all of the mines at once, but staggering the explosions into groups, waiting for one group to clear before the next explodes. The cheat-only hunting knife weapon has been made inaccessible in the Japanese version. It is not available when using the All Guns cheat. 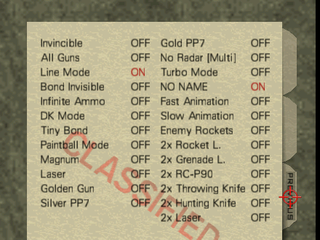 Instead of the 2x Hunting Knife cheat, the Japanese version has a Rifle/Launcher cheat, which gives Bond a paired rocket launcher and sniper rifle, with full ammo for each weapon. When using the two weapons together, the sniper rifle's adjustable scope can be used. Unlike the 2x weapon cheats, each weapon can also be used separately. Silo only has one intro camera in the American version. Four more were added in the Japanese and European versions. 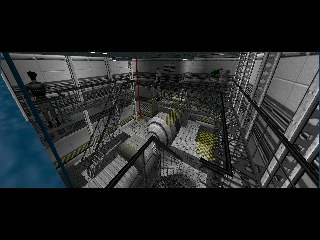 The position of the camera showing the engine room in Frigate was moved slightly in the Japanese and European version. While its original position was fine with the default full screen and normal ratio settings, the left wall can be seen through with widescreen in 16:9 ratio, or cinema screen in either ratio. Missions have the same amount of body armor available regardless of the difficulty chosen in the Japanese version; the amount available is reduced on harder difficulties in other regions. Auto-aim also behaves the same way on all difficulties in the Japanese version. It isn't as strong on higher difficulties in other regions. The music stops briefly upon starting a mission in the Japanese and European versions. In the American version, the menu music continues to play until the mission loads and its music begins playing. All music in the European version is higher pitched by approximately 2%, consistent with the difference between the PAL and NTSC DAC rates. Killing Valentin after completing objective A in Statue will fail all objectives in the Japanese and European versions. This page was last modified on 8 March 2019, at 10:23.